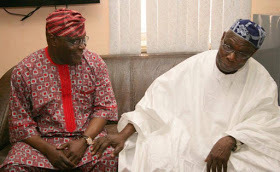 PDP presidential candidate arrived at Abeokuta home of former President Olusegun Obasanjo, although the ex-president had said he would never support Atiku's presidential campaign. Atiku, however, hopes to convince the former president to support his ambition, hence the visit. He arrived at 1:20 pm at Obasanjo. He was accompanied by the PDP National Chairman, Uche Secondus, the Director-General of the Atiku Campaign Organization, Gbenga Daniel, Ben Bruce and many more.